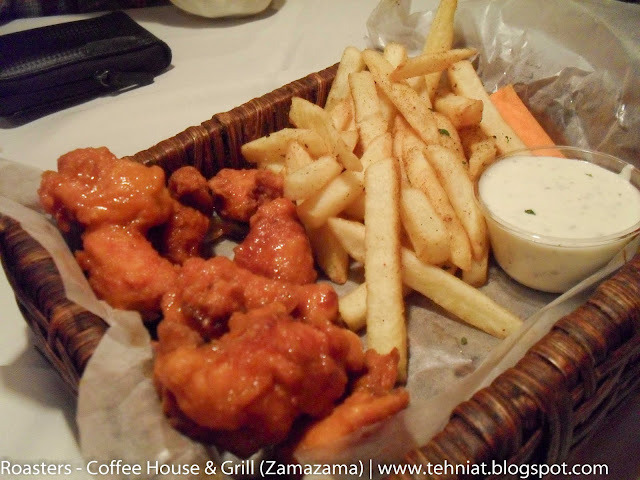 Having a unique, contemporary look - dark wooden furniture, crowded with people from all age groups, Roasters is a coffee-house and grill situated in the posh area of Zamzama. The interior is dark, with dim, low-hanging ceiling lights. It offers quite a variety of Burgers and Steaks. 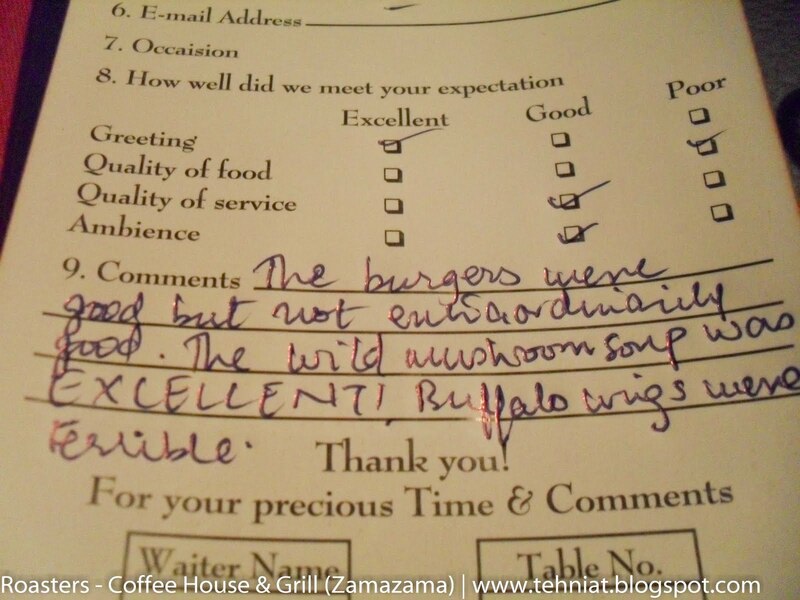 Trying out the place for the very first time, I ordered the food using my food instincts - Wild Mushroom Soup, Mozzarella Cheese Sticks, Buffalo Bites and Chicken Bacon Burger. We were first served with the soup. It was extra-ordinarily delicious. It tasted like mushrooms, perfectly creamy and the presentation was excellent. 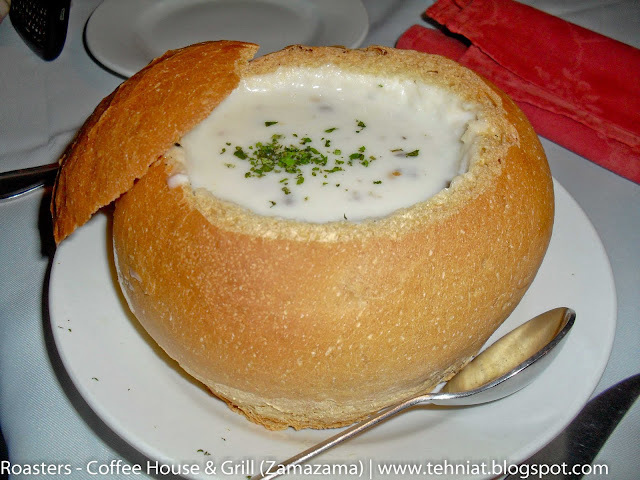 The texture of the soup was perfectly smooth and I just loved it when it went in my mouth. My expectations for the starters and main dish rose up that instant and I awaited more delicious food to be served. 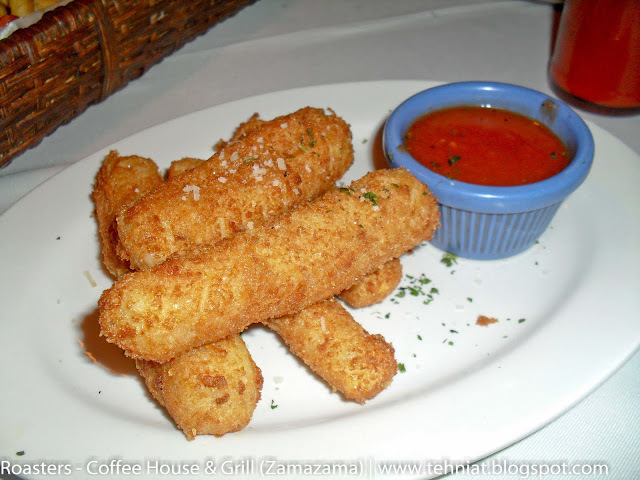 Then came the Mozzarella Cheese Sticks and Buffalo Bites - The cheese sticks, served with a perfect Bab-B-Que marinara sauce, was good, though I expected them to me more stringy and chewy as per Mozzarella cheese's nature, but it was worth eating anyways. The Buffalo Bites, looked average as far as presentation was concerned. Then came the most torturous moment of the day: I took a bite of the Buffalo Bites and it was terrible. I know it's made up of butter and hot sauce, but why didn't it taste of Chicken? The bites were a bit on the sour side, most probably because of the excessive use of the hot sauce and had no taste whatsoever. The fries and the dip served with it were fine though. 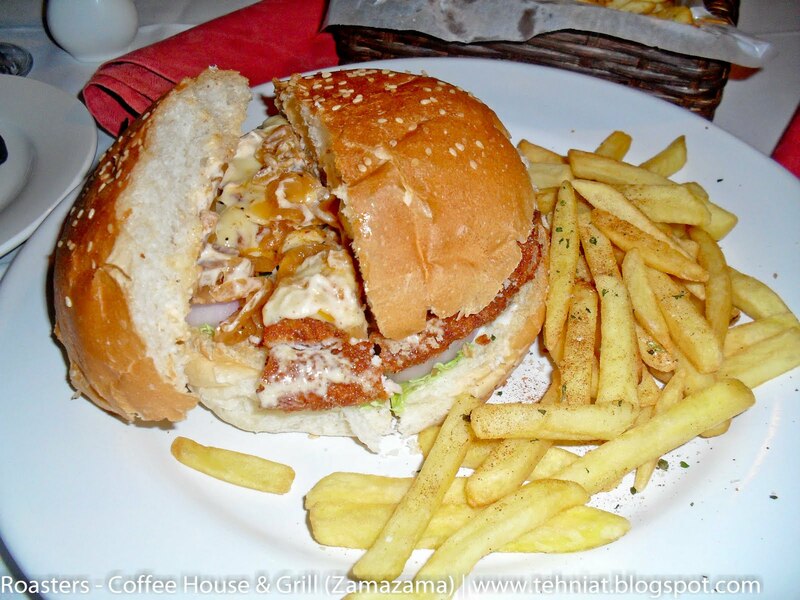 Moving on to the Chicken Bacon Burger, it was huge (but not as tasty as I expected it to be)! But since I had the soup which was really good, I expected the burger to be even better. It was good, but not extraordinary. The servings of all: soup, starter and the entree was good. The rates of the dishes were a bit steep though. If you order one soup, starter and one main dish with a drink, it costs around 750-1000 rupees (depending on the dishes). But be careful while ordering, the servings are large, and you might order too much. I've always loved waking up early in the morning and going out for breakfast with my dad. The classic quick breakfast for us is Anda/Aloo Paratha with Doodhpatti and the best place to get them from is a 'pathan ka hotel'. The crisp flour parathas, golden-brown, with omelet style egg and doodhpatti (tea) is absolutely scrumptious. We go to a specific 'dhaaba' at Phase II (ext) in Defence, Karachi. It's in the lane of A-One Snacks (a few steps away from it), by the name of 'Shah Jee' Hotel. You also get 'kahva' (green tea) and Aloo ka paratha from there with the most 'mazeydaar' doodhpatti ever. Having a paratha from there is a must! Go early morning around 7 - 7.30 am. It's quite enjoyable.